Views: 356,027 | 3 Global Users. 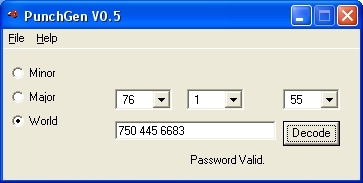 PunchGen is a Password Generator for Punch Out. It was started back in 2006 and kept getting updated slowly throughout the years till I had a break through this year making a Version 0.5. It will encode and decode about 98% of all the passwords, there was some code while decoding it I still never understood. Release date 12/25/2010.